I get it — many relievers aren’t that exciting. There’s the highest tier, and then there’s all the rest, and it can be hard to tell which among the rest are really and truly good. This time of year, seemingly dozens of adequate relievers find new teams, and they always have their various upsides. They all seem okay, which means few of them stand out. No one pays close attention to the winter meetings to see who’ll get a new option for the seventh or eighth inning. But, look. According to reports, Tommy Hunter is signing a two-year contract with the Phillies. Now, one notable thing is that the Phillies are not good. They’re not good, and yet they’re signing Hunter, to go with their signing of Pat Neshek. Might as well do something. Nobody wants a terrible bullpen. Hunter isn’t in the Kenley Jansen tier, and he’s not thought of as being close to Wade Davis. It’s very possible you didn’t even realize Hunter just appeared in 61 major-league games with the Rays. It was quiet. But Hunter brought his game up to a new level. As a reliever in 2017, Tommy Hunter was legitimately great. This gets to the core of what I mean. 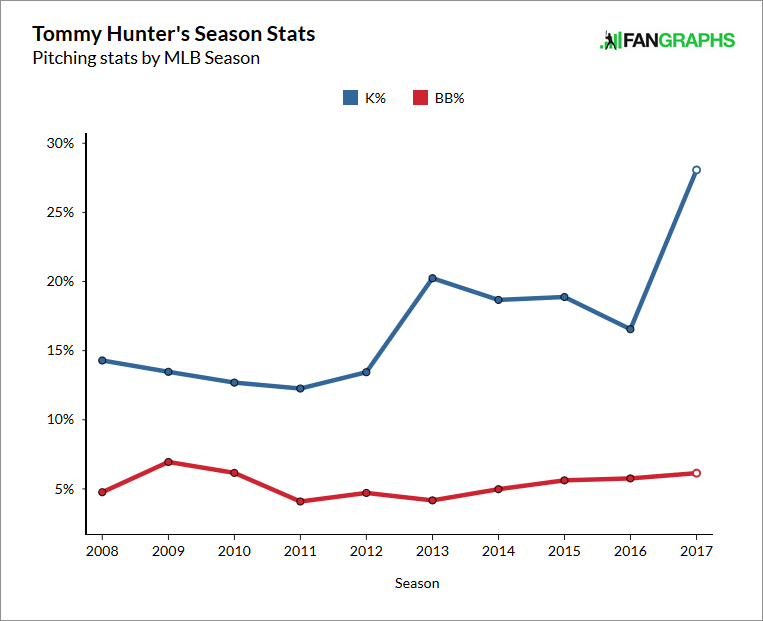 Behold Hunter’s career year-by-year walk and strikeout rates. Hunter has always thrown hard. His fastball rides in around 96, and, if you can believe it, he throws something resembling a cutter that averages 94. Hunter has never before been on the major-league disabled list with an arm injury. His arm has always been good, and this past season, Hunter best put it to use. Among relievers, he ranked in the 89th percentile in wOBA allowed, by names like Brad Hand and Raisel Iglesias. Even better, by Baseball Savant’s expected wOBA allowed, he ranked in the 97th percentile. Behind Roberto Osuna, and in front of Mike Minor. Hunter, you could say, broke out, and from the sounds of things, he went and got Raysed. One thing the Rays did was have Hunter throw fewer and fewer four-seam fastballs. 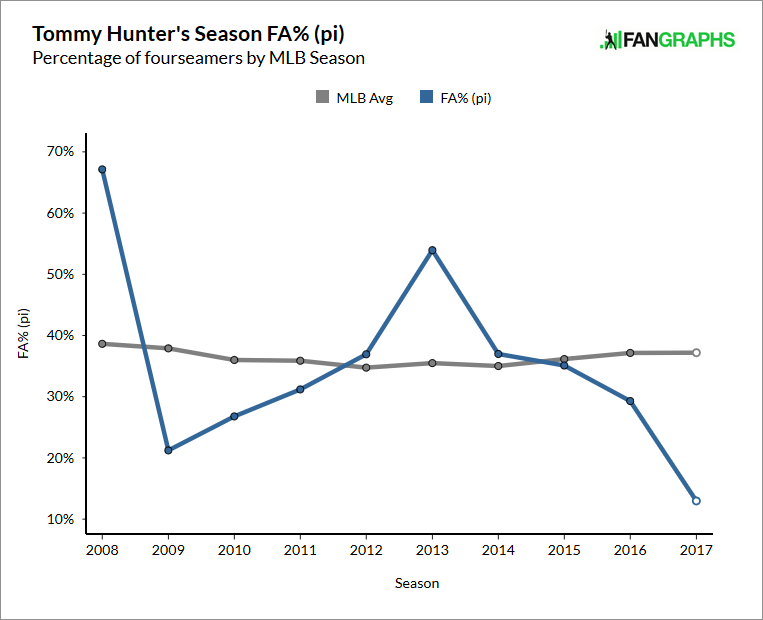 Hunter leaned more often on his cutter, especially against lefties, and partially as a consequence, you can see a distinct change in Hunter’s overall pitch pattern. 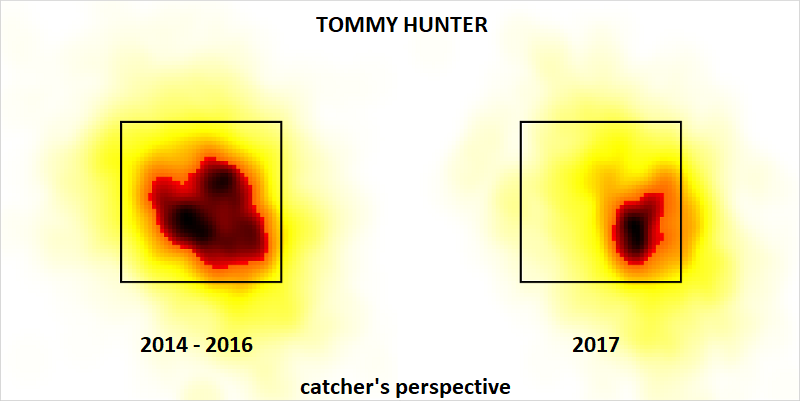 Below, on the left, you see where Hunter threw his pitches from 2014 through 2016. On the right, you have 2017. Hunter stayed away against righties, and he stayed in against lefties. Armed with good command, Hunter was able to use his curveball off of that arm-side cutter, and lefties slugged just .261. Righties didn’t fare a whole lot better, so, when you combine everything, Hunter was a hard-throwing strikeout reliever who could retire opponents on both sides of the plate. What Brandon Morrow had going for him, Hunter basically had, too, and Hunter is younger, with a better record of health. It’s a little strange, therefore, to see Hunter sign with a team unlikely to feature in the race, but then, every team wants late-inning stability, and obviously there’s the trade consideration down the road. It’s possible Hunter was met with some industry skepticism; teams might not have known whether Hunter could stay so successful as part of another, non-Rays organization. Now the Phillies will give him some dozens of innings, if everything goes well, and then if Hunter looks more or less the same, he’ll be in great July demand. Power pitchers who throw strikes in big situations are limited in number, and every team at the deadline wants a deeper bullpen. There’s nothing unique here about the Phillies’ approach. Bad teams have long looked to flip relievers midseason. Hunter is the real story, looking like a potential shutdown setup guy a year after settling for a minor-league contract. All he needed was a handful of pointers from his handlers in Tampa Bay. The rest of it was all up to him. We hoped you liked reading New Phillie Tommy Hunter Got Raysed by Jeff Sullivan! I’m a bit surprised the Phils landed Hunter. I thought a better (more advanced on the win cycle), more “statsy” team would sign him. But I’m liking what they’re doing here. I don’t get the impression that the Phils are signing guys in order to flip them later (though they could be flippable if the season crashes). Looks to me like the Phils are trying to create a really solid BP, with the intent to win some games. And with their young and improving lineup… they could be poised to maybe take a step. If they don’t take that step… well… yeah, these BP guys could have extra value at the deadline. Was really hoping the Indians would give him a second go-round. After the A’s signed Petit, he was next on my list of possible Shaw replacements. It seems like a pretty solid strategy. If he throws another 40 excellent innings, they can deal him at the deadline for a nice return with the reliever premium, or hang onto him if they are somehow in contention. If he bombs out, they haven’t really lost much. Wish the Twins were making some signings like this. maybe he really likes cheese steaks?